We're back again with Mitzi as model. 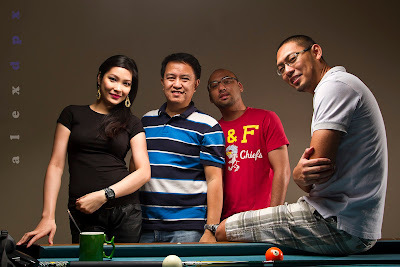 This time, we're on the pool table trying to make her look like a real billiard player. From the start, my lighting thoughts were to make it look like an actual pool table scenario so there can only be one way to light this and that is to hang one soft box right on top. 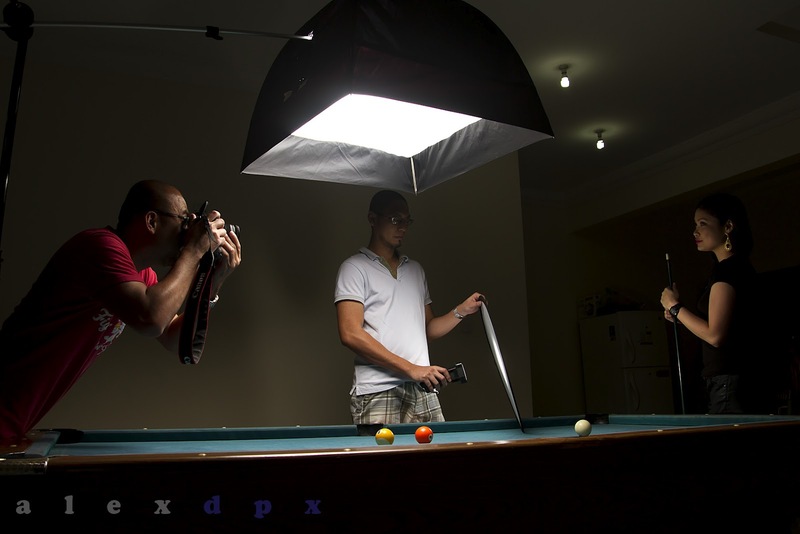 Sounds simple enough but that lighting setup was designed for playing billiards, not for photography. Obviously, there are obstacles to overcome if that lighting is to work. Main light was hanged with a boom above the pool table, just like a normal pool table lighting. Fill lights were provided by a grid snooted flash then diffused with a transluscent panel. For closer shots, we used a white reflector to open up shadows and provide cath lights. We also used a grid snooted speedlite located at about 3 meters away from the subject to provide rim lighting when appropriate but for most of the shots it's just the main light and fill / reflector. 1. For the in-action shots and full body (well, they're more like half body since the lower half was covered by the table.) I used one speedlite with a grid snoot and had it directed at her face but I found that light too hard and was illuminating the wall behind her a little bit too much. And then, of course, there's the unwanted shadows as we move the "fill light" around. To tone it down and diffuse it a little bit, I had the transluscent white surface of my small reflector in front of that flash and positioned it as close as possible to the model, close but far enough so it does not appear in the frame. By doing this, I'm achieving 2 things - positioning the light source close to the subject makes its apparent size bigger, resulting in softer light. And the short distance means not needing so much power to illuminate your subject - you eliminate spill and light fall-off gets accelerated that it barely reaches the background wall. I wanted the fill light to just open up some details in the shadow areas so I opted to use a white reflector instead of another flash. It did the job well and provided some nice catch lights in her eyes. 2. For the closer shots, we only needed to light her face and upper body so I only used the opaque white surface of the reflector. I usually avoid the silver reflector because the light it reflects is oftentimes as harsh as direct light causing too much glare for most eyes to bear. White reflectors do 2 things beautifully. First, it opens up shadows without being an obvious light source. Second, it gives eyes a more natural sparkle. I'm not a fan of "glass eyes" effect that a lot of photoshoppers are doing these days. Well, there you have it. Another lighting setup that is simple yet very effective in defining the photoshoot concept. More lighting tips next time. Please read also The Concept Driven Lighting (Part 1). Thank you.